A pre-HERCULES PEPLUM from Italy, shot in color and standard aspect ratio. It's one of those films that's frustrating in that there are no correct copy of it anywhere. This screenshot was taken from a recent pseudo-HD broadcast. It's in Italian with French subs. I've been trying to do a Fan Dub of this title for years now and this copy was promising until I saw that it had French subs burnt in. Can't use this one. This film has two different version: European version and an American version. The English audio from the US version doesn't match the action and script of the Europe version. 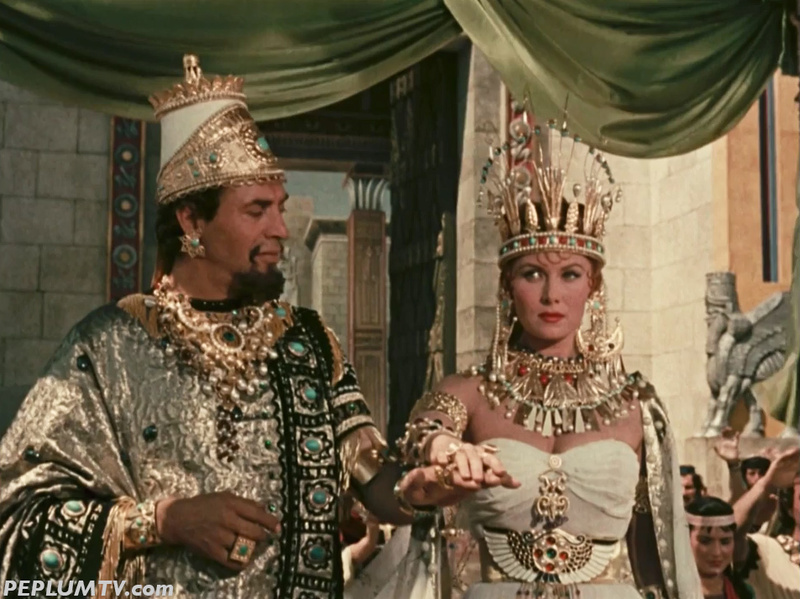 As for the film itself, it has very little to do with actual Babylonian history. Assur never had a wife named Semiramis. And the legend of Semiramis has nothing to do with Assur or existed during Assur's reign. Even with all of this, it's still fun kitschy entertainment.